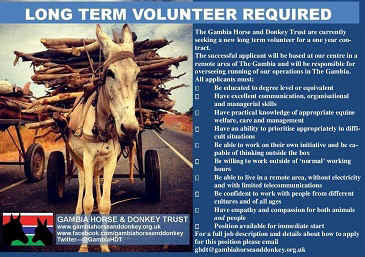 We are currently seeking a new long term volunteer to be based in The Gambia. We always have two long term volunteers based in The Gambia, which means that once roughly every six months we are looking to recruit someone new to join our team. This is a very busy and challenging role which will offer the successful candidate fantastic experience and opportunity. The successful candidate will be based in The Gambia for one year and oversee all operations of the charity and complete all administrative tasks required. All applicants must be educated to a minimum of degree level, be an excellent team player, have very good communication skills and able to think outside the box. They will be based in a remote, rural location with very basic amenities and no electricity. If this sounds like the type of challenge you would enjoy being involved with, please email the GHDT Office for further information and a job description. If you would like to apply for the position, please send a copy of your CV and covering letter to the GHDT Office at the same email address. Copyright © 2005 - 2019 GHDT. All rights reserved.